An independent Syria news outlet, Deirezzor 24, reported that the Coalition forces in Syria carried out a landing operation west of Deir Ezzour to airlift two ISIS commanders and their families on August 26. The reporter referred to the two ISIS commanders as “spies” for the U.S.-led Coalition. While the article did not provide any evidence to support its reporting, it was quickly picked up by both Kremlin-funded and fringe media outlets. As the article spread, the original headline changed slightly to fit the narrative of the different outlets. 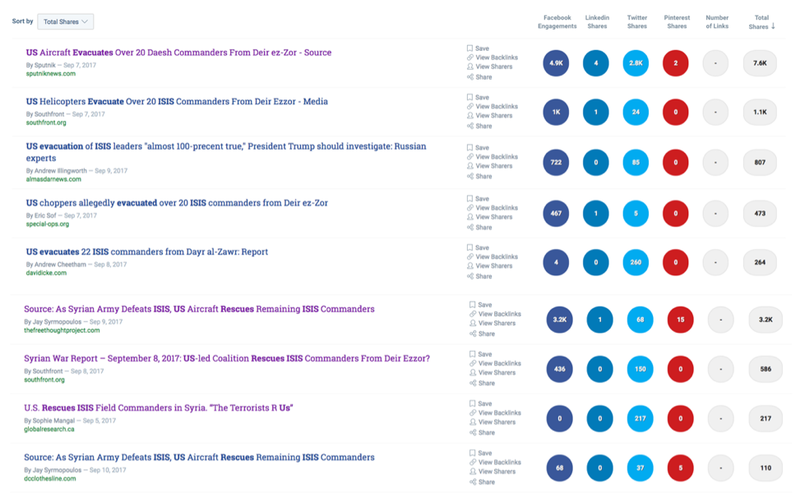 A comparison of headlines reported by Deirezzor24 and GlobalResearch.ca, South Front, and Veterans Today. Amid successful actions by Syrian government troops in the eastern part of Syria in late August, a number of field [Daesh] commanders backed by US special services, had been promptly evacuated from Deir ez-Zor to safer regions in order to use their experience in other directions. This was “confirmed” by the same anonymous “military and diplomatic” source as the initial story. Sputnik reached out to the press office of the Combined Joint Task Force of the Operation Inherent Resolve, which called the allegations false. Again, Inside Syria Media Center does not provide a source for the statement. The same was reported in a GlobalResearch.ca article titled “US Rescues ISIS Field Commanders in Syria. “The Terrorists R US”, in which the only link to a source was the Deirezzor24 article referring to one unsubstantiated incident. 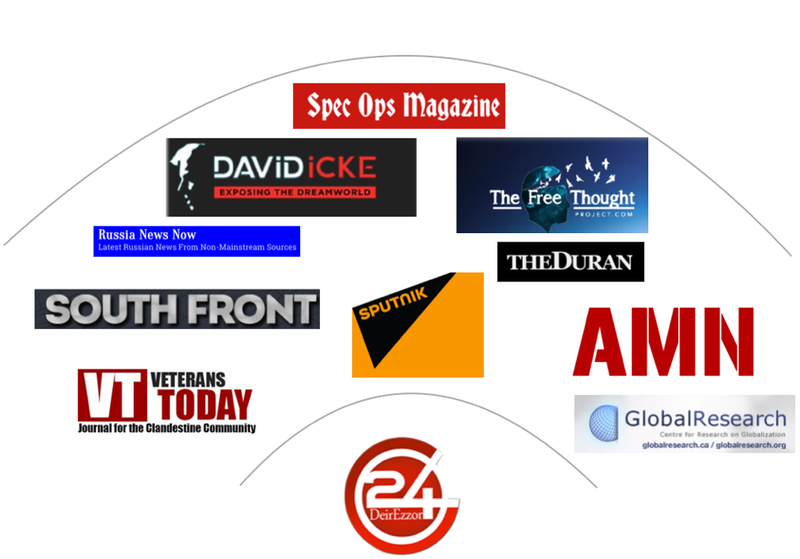 Nevertheless, at least ten fringe media outlets reported on Sputnik’s interview with the anonymous source “confirming” the two evacuations, including The Free Thought Project, The Duran, and Al-MasdarNews. @DFRLab wrote about the Al-Masdar news outlet before, when its unsourced article on a chemical attack in Syria inspired #SyriaHoax, an attempt to call in to question Bashar al-Assad’s use of chemical weapons (verified by the Organization for the Prohibition of Chemical Weapons, an international watchdog) that led to U.S. airstrikes in April. We found that Al-Masdar is owned by Leith Abou Fadel, an Assad loyalist with close ties to the regime. It serves as an unofficial government outlet and repeatedly attacked regime critics and witnesses to regime atrocities, notably the White Helmets. The spread of the story across Kremlin-funded and fringe media outlets. The analysts Al-Masdar’s reporting referred to include Igor Korotchenko, editor-in-chief of the Natsionalnaya Oborona (National Defense), and Franz Klintsevich, first deputy chairman of the Russian Upper House’s Defense and Security Committee. 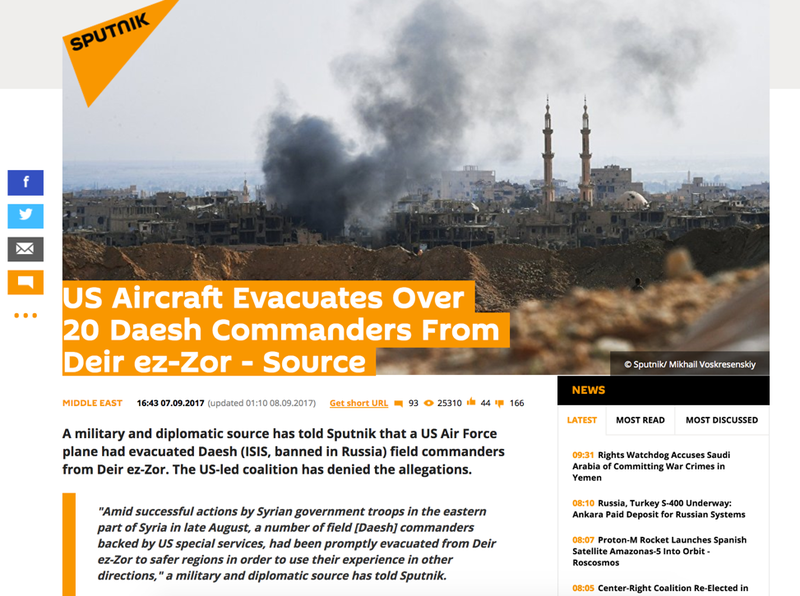 Both were interviewed by Sputnik in an article titled “Trump Must Comment” based on Sputnik’s earlier and anonymously sourced article “US Allegedly Rescuing Daesh Commanders from Deir ez-Zor”. It is President Trump who must comment on this and declare clearly: either the evacuation of the Daesh field commanders was authorized by him personally and he assumes all political responsibility for this step, or the [US] special services acted without his approval. Copies of stories alleging that the United States rescued ISIS commanders was shared more than 14 thousand times in total, generating thousands of impressions and clicks without a shred of evidence to support it. The spread of this story demonstrates how a network of both Kremlin-funded loosely alingned fringe media outlets can seed a baseless story in fringe media outlets. This goes on to show how little respect for evidence-based reporting certain media outlets have when it comes to spreading an anti-U.S. narrative. Donara Barojan is a Digital Forensic Research Associate at the Digital Forensic Research Lab (DFRLab).